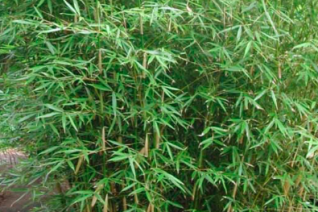 Nothing beats the texture of bamboo for an exotic look, many can be grown in our climate though running bamboos have given others a bad name, we grow only clumping varieties. 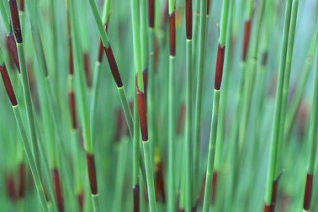 Restios are not grasses at all but a group of ancient plants from the southern hemisphere with the same fine texture and allure as bamboos and grasses. 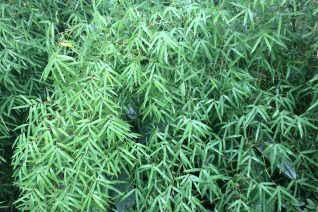 Little leaf clumping Bamboo has risen to the top as one of our favorite Bamboos. 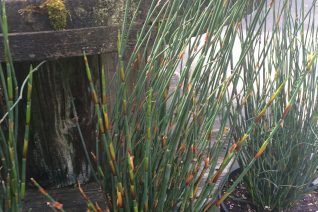 Rapid growing with culms shooting quickly to 10′ tall, they then become clad in masses of tiny mid-green leaves as the culms begin to leaf they slowly sink down. The effect is a a wide spreading fountain. The clump increases painfully slow though and the 1/2″ culms crowd together at the base. Part shade to shade in any well drained soil. Extremely drought adapted for a bamboo. Though it does not run you must give it a wide berth to arch. Amazing texture of green fountains. Culms are purple upon expanding. Light summer water. Protect from reflected heat of hot walls.